If you already have a Master Account on your IP (family member, friend etc etc) you must make a support ticket from the already registered Master Account HERE. 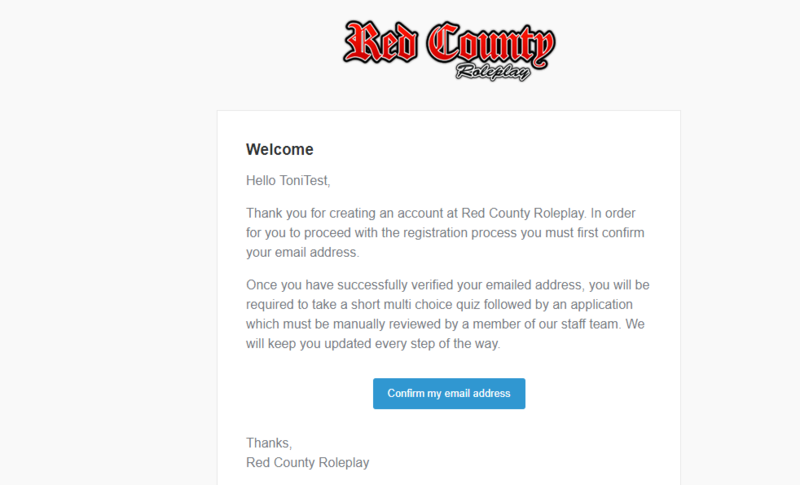 1 - Initial registration First thing you need to do is head over to https://redcountyrp.com/register and fill in the details on that page. Please remember that username is not your character name, it's your Master Account username. You will be using this username to login to the UCP and the game server. Once you have registered your account, head over to your e-mail and confirm the registration. Make sure to check your inbox and spam folder. After you have activiated your account, you will be taken to the homepage and you will have the option to start the quiz, simply click on To the quiz! The quiz consists of a couple of multi-choice questions which will determine your roleplay knowledge. You must pass the quiz with 10 score out of 10 in order to move to the written application. The written application will determine your English skills and Roleplay knowledge. Make sure you put enough effort into the application (proof-read it for any spelling errors, grammatical issues etc). Copying a character story from the internet or asking someone to write it for you will result in your application being rejected. VPN's and Proxies are also not allowed, please turn them off before applying. After you submit your application, an admin or tester (also known as application handlers) will need to review your application and either approve, temporarily deny or permanently deny your application. Please do not contact them, applications are usually handled within 24 hours or less. You can check your application status HERE. 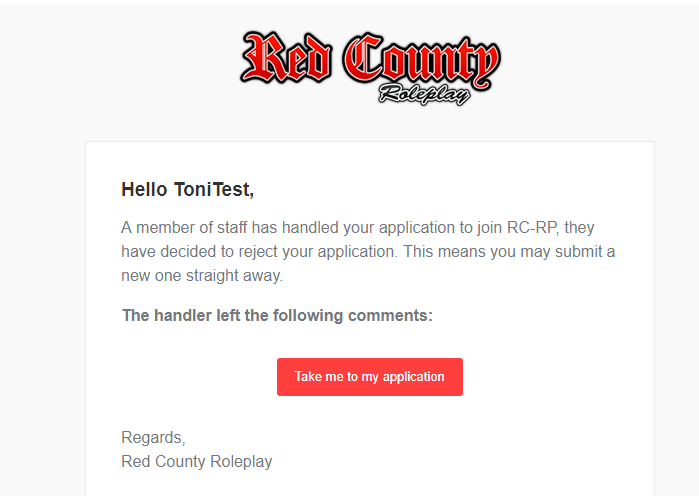 If your application has been accepted, you will receive an e-mail that states it's been accepted and you can now create your character. If your application has been temporarily denied, you will have to submit a new one. A handler can either allow you to instantly re-take the application or an X amount of days. You will, once again, receive an email with the reason for your temporary denial. Make sure to fix the errors listed by the handler or else your application can be permanently denied. 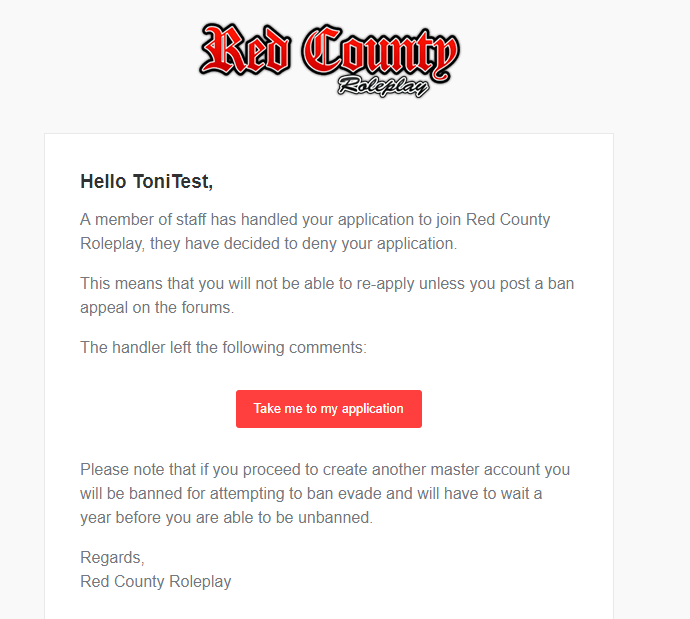 The difference between a permanent and temporarily denial is that a permanent deniel will not allow you to submit another application until you post a ban appeal HERE. The reason for your permanent denial will be given by the handler, check your e-mail for more information. 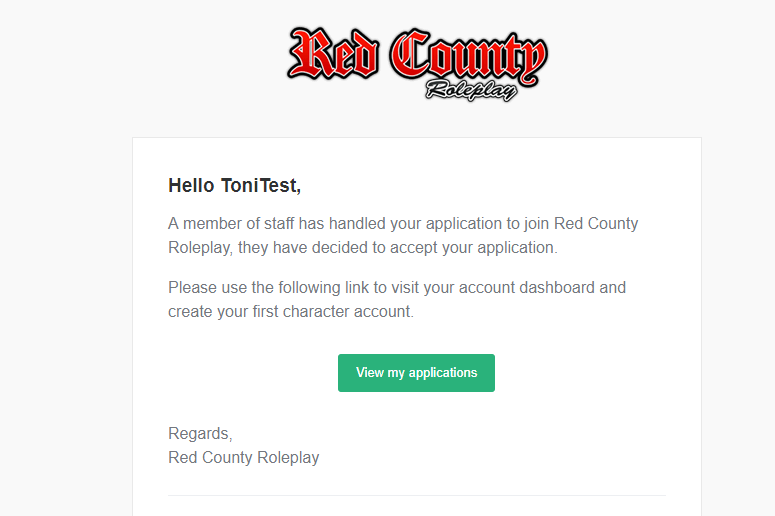 Once you have passed your application, you can now create your first character and get in-game! Go to the user dashboard (Found HERE) and click Create. Choose any name you want (as long as it's a valid realistic name) and separate it with Firstname_Surname format, note the underscore. Make sure in the name field on your SA:MP client, it says your Master Account username, NOT your character name. 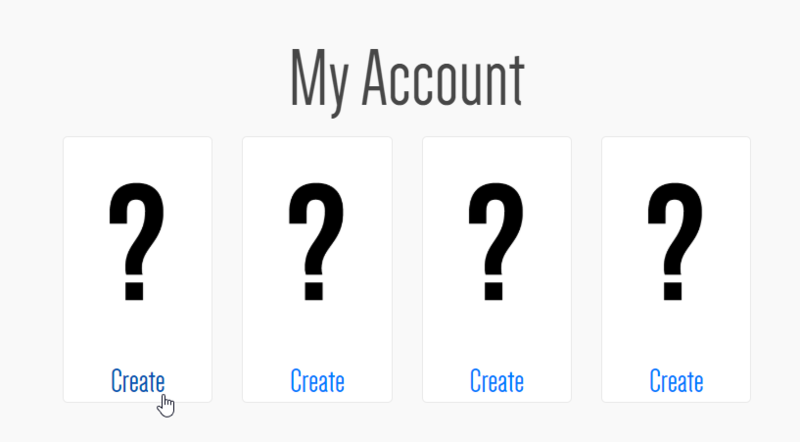 Your Master Account username is the one you set in the Username field in the registration process. One of our management team members, @Earl has created a fantastic guide for newcomers. It includes all information you might need, it's worth the read! I guess the days where you had to google up whether RP means Rap Patriotism or not are over. Appreciate the guide, although I wish I'd seen it sooner! Application has been sent off, fingers crossed.